Here is a statement of the data requirements for a product to support the registration of and provide help to students of a fictitious e-learning university. An e-learning university needs to keep details of its students and staff, the courses that it offers and the performance of the students who study its courses. The university is administered in four geographical regions (England, Scotland, Wales and Northern Ireland). Information about each student should be initially recorded at registration. This includes the student’s identification number issued at the time, name, year of registration and the region in which the student is located. A student is not required to enroll in any courses at registration; enrollment in a course can happen at a later time. Information recorded for each member of the tutorial and counseling staff must include the staff number, name and region in which he or she is located. Each staff member may act as a counselor to one or more students, and may act as a tutor to one or more students on one or more courses. It may be the case that, at any particular point in time, a member of staff may not be allocated any students to tutor or counsel. Each student has one counselor, allocated at registration, who supports the student throughout his or her university career. A student is allocated a separate tutor for each course in which he or she is enrolled. A staff member may only counsel or tutor a student who is resident in the same region as that staff member. Each course that is available for study must have a course code, a title and a value in terms of credit points. A course is either a 15-point course or a 30-point course. A course may have a quota for the number of students enrolled in it at any one presentation. A course need not have any students enrolled in it (such as a course that has just been written and offered for study). Students are constrained in the number of courses they can be enrolled in at any one time. They may not take courses simultaneously if their combined points total exceeds 180 points. For assessment purposes, a 15-point course may have up to three assignments per presentation and a 30-point course may have up to five assignments per presentation. The grade for an assignment on any course is recorded as a mark out of 100. 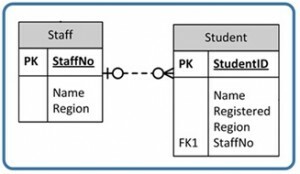 The university database below is one possible data model that describes the above set of requirements. The model has several parts, beginning with an ERD and followed by a written description of entity types, constraints, and assumptions. The first step is to determine the kernels. These are typically nouns: Staff, Course, Student and Assignment. The next step is to document all attributes for each entity. This is where you need to ensure that all tables are properly normalized. Create the initial ERD and review it with the users. Make changes if needed after the ERD review. Verify the ER model with users to finalize the design. Figure A.1. University ERD. A data model for a student and staff records system by A. Watt. Staff (StaffNo, Name, Region) – This table contains instructors and other staff members. A staff member may only tutor or counsel students who are located in the same region as the staff member. Students may not enroll for more than 180 points worth of courses at any one time. The attribute Credit (of Course) has a value of 15 or 30 points. A 30-point course may have up to five assignments; a 15-point course may have up to three assignments. The attribute Grade (of Assignment) has a value that is a mark out of 100. A student has at most one enrollment in a course as only current enrollments are recorded. An assignment may be submitted only once. Using Figure A.2, note that a student (record) is associated with (enrolled) with a minimum of 1 to a maximum of many courses. Each enrollment must have a valid student. Note: Since the StudentID is part of the PK, it can’t be null. Therefore, any StudentID entered, must exist in the Student table at least once to a maximum of 1 time. This should be obvious since the PK cannot have duplicates. Figure A.2 by A. Watt. Refer to Figure A.3. A staff record (a tutor) is associated with a minimum of 0 students to a maximum of many students. A student record may or may not have a tutor. Figure A.3 by A. Watt. Note: The StaffNo field in the Student table allows null values – represented by the 0 on the left side. However, if a StaffNo exists in the student table it must exist in the Staff table maximum once – represented by the 1. Refer to Figure A.4. A staff record (instructor) is associated with a minimum of 0 courses to a maximum of many courses. A course may or may not be associated with an instructor. 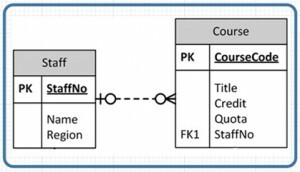 Note: The StaffNo in the Course table is the FK, and it can be null. This represents the 0 on the left side of the relationship. If the StaffNo has data, it has to be in the Staff table a maximum of once. That is represented by the 1 on the left side of the relationship. Figure A.4 by A. Watt. Refer to Figure A.5. A course must be offered (in enrollment) at least once to a maximum of many times. The Enrollment table must contain at least 1 valid course to a maximum of many. Figure A.5 by A. Watt. Refer to Figure A.6. An enrollment can have a minimum of 0 assignments or a maximum of many. An assignment must be associated with at least 1 with a maximum of 1 enrollment. Note: Every record in the Assignment table must contain a valid enrollment record. One enrollment record can be associated with multiple assignments. Figure A.6 by A. Watt. 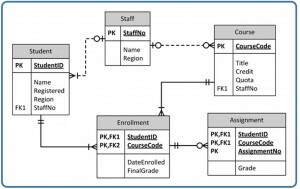 Appendix A University Registration Data Model Example by Adrienne Watt and Nelson Eng is licensed under a Creative Commons Attribution 4.0 International License, except where otherwise noted.